The ATECC108A provides a full turnkey Elliptic Curve Digital Signature Algorithm (ECDSA) engine using key sizes of 256 or 283 bits - appropriate for modern security environments without the long computation delay typical of software solutions. Access to the device is through a standard I2C Interface at speeds up to 1Mb/sec. It is compatible with standard Serial EEPROM I2C Interface specifications. The device also supports a Single-Wire Interface that can reduce the number of GPIOs required on the system processor or reduce the number of pins on connectors. If the Single-Wire Interface is enabled, the remaining pin is available for use as a GPIO which can be asserted or read under program control. It can also be connected to an authorization event for a specified key to provide an external indication of proper authentication or to enable a hardware component of the system. 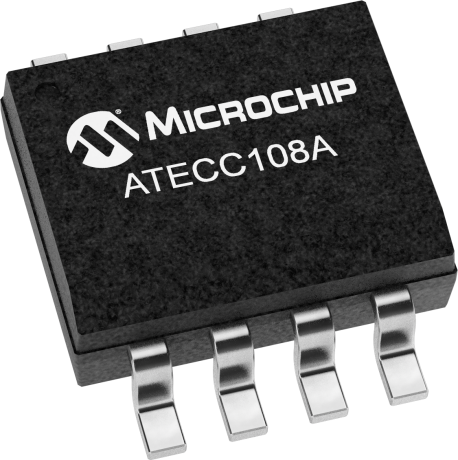 The ATECC108A can generate high-quality Federal Information Processing Standards (FIPS) random numbers and employ them for any purpose, including usage as part of the device?? ?s crypto protocols. Because each random number is guaranteed to be unique from all numbers ever generated on this or any other device, their inclusion in the protocol calculation ensures that replay attacks (re-transmitting a previously successful transaction) always fails.